Indeed we did visit the O’Dubhda clan gathering from 8 till 11 October 2009. It was great fun and we met lots of O’Dowd’s. 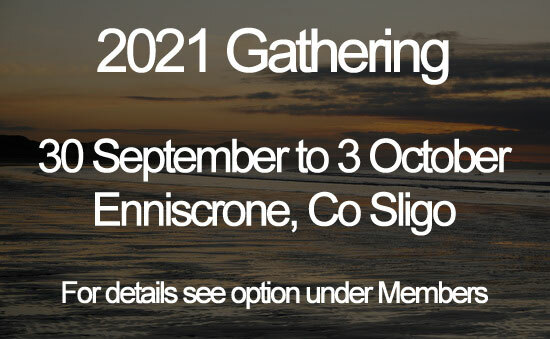 The gathering was held at the Ocean Sand Hotel in Enniscrone, Co.Silgo Ireland. There were at least 4 Aussies, at least 12 Yanks, 8 or more from Scotland, at least 10 Irish, 4 from Canada and 4 Dutch (South African branch). In total I guess between 45 to 50 attendants. The oldest being retiring Taoiseach Edward P. O’Dowd from Chicago 84 years old and the youngest, my son Tom O’Dowd from the Netherlands 7 years old. Thursday 8 October the O’Dowd’s from all over the world started gathering at the Ocean Sands Hotel. After registration and the welcome address short talks were given on ancestral research and there was also an exhibition of O’Dubhda history. Friday consisted of a genealogy workshop and a local tour to view Enniscrone Castle (one of the twenty O’Dowd Castles in O’Dubhda Country) and other interesting sites. In the afternoon there was a meeting of the Chieftains Council. In the evening there was time for late registration followed by short talks on history and genealogy. On Saturday morning a bus tour was organized to Céide Fields, the largest stone age site in Europe. In the afternoon there was an open meeting of the clan followed by the election of the new Tánaiste and the Inauguration of the Taoiseach. Brendan O’Dowd of Ireland was elected as Tánaiste and Mike Dowd from Brisbane Australia was inaugurated Taoiseach. The clan Banquet started at 7.00 pm in the Ocean Sands Hotel restaurant. Special thanks were given to Conor Mac Hale and his wife in acknowledgment for his work organizing the gatherings and recording the history of the O’Dubhda over the years. Sunday morning mass was followed by the closing ceremony. The afternoon was spent on a tour visiting the O’Dubhda Castles and sites, including a castle that was for sale.